Learning NEXT: The Revenge of a Second Grader? This is how I'm picturing this: the second grader gets up in the morning knowing he has a math test. As he dresses himself, without any reminders or haranguing from a parental unit, and as he contemplates his reflection in the mirror as he brushes his teeth after breakfast, he plots how to get revenge against the Common Core on his math test. He figures he'll show "them" the error of their ways. When he gets to class, he is calm and lucid. He's gone over his plan several times and he's confident it will work. He waits with barely contained impatience to get his math test. And when he does. . .pow! The plan is launched. 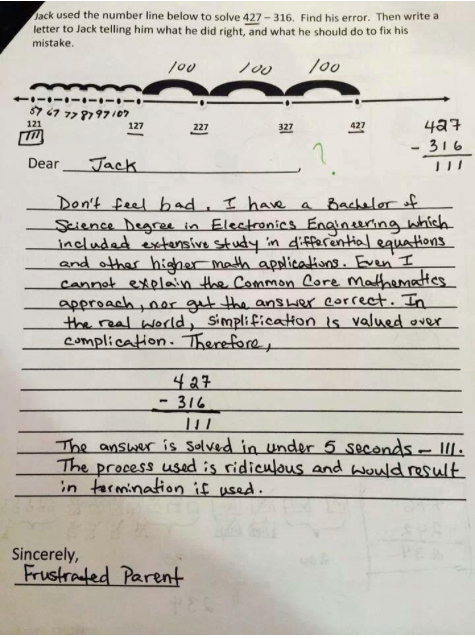 If you've not seen the articles (some of which are reposting of the original mindless, uninformed rant against Common Core), there are a couple of versions of the 2nd grader who took revenge on the Common Core. Those are the words of others, not me. It is far too ludicrous for me to have imagined the original concept, but I can fill in some blanks on my own, which are, of course, equally ludicrous. In this problem, the student was asked to write a number sentence to show a solution for the problem and then explain the number sentence. It's a pretty good math problem and the student worked it out correctly, creating a number sentence to answer the problem. The student's challenge was with the explanation. However, in his defense, the expectation for the explanation might not have been clear to him; I think it was worded awkwardly. I liked the student's answer because he tells me he thought through the answer and agreed that he was on the right track. The issue here is not the Common Core, but the way the problem was worded. I think the student did the best he could under the circumstances. To the writers of word problems, three things: 1) audience, people--don't forget to whom you are writing and the academic and content area vocabulary with which they are likely familiar; 2) make sure the expectations are clear from the likely reading level and perspective of said audience; 3) Dan Meyer's TEDTalk. Go watch it. Now. Someone else posted this problem and the reply from a clearly frustrated parent. I wish I knew the origin of this problem as it's not clear from the paper. Probably best. I appreciate the parent's frustration. Quite honestly, I think it's odd to solve a problem with clear and specific numbers using a number line. If the person designing this problem was remotely familiar with the Standards for Mathematical Practice (SMP), that person might know that SMP 5: Use appropriate tools strategically. Does it really make sense to use a number line to solve a problem when you already know the task is to determine the result of 427-326? In a word, "no." If a student is having trouble with place values, there are far better tools to use than a number line. So, in my opinion, this is another example of a bad math problem and that has nothing to do with Common Core. However, I also know that far too many educators and parents are suffering from misunderstandings, misinformation, bad or non-existent professional development, and/or poor implementations. So this problem, if created by the student's teacher, is likely because this teacher is trying to create Common Core-like problem and has no idea what he or she is doing. Teachers are being told not to use worksheets, but even that is misinformation. It might make sense for a teacher to give students a worksheet to test their knowledge and understanding. Maybe not 25 problems that nearly exactly alike, but, looking at this sample, giving students fewer than 10 problems to make sure the students know place values and adding up to two-digit numbers. But fewer problems will tell a teacher that more quickly and as accurately and with less frustration on the part of the student. It's faster to diagnose where misconceptions might be if students work through about 5 problems and discuss one of the problems that might seem particularly difficult, either in pairs or groups. And maybe some of those problems use three-digit numbers or include some basic subtraction, just to see if students can reason through the process. That hits up SMPs 1, 2, 3, and 7. At any rate, after a relatively short amount of time, clarity abounds--for teacher and students--and then the teacher can move to word problems, provided those problems are authentic tasks. If teachers aren't familiar with the instructional shifts, Standards for Mathematical Practice, and the Anchor Standards for Reading as well as Webb's DOK, they're going to spend a lot of time spinning their wheels, frustrating themselves, their students, and their students' parents. And offering up more "proof" for the anti-Common Core people. Here's a shameless plug: I did a workshop recently for several curriculum, instruction, and assessment folks and we talked about the instructional shifts, Standards for Mathematical Practice, the Anchor Standards for Reading as well as Webb's DOK and using those as resources to help educators think about their own instructional planning and practice as well as how they think about doing their assessment (assess at the same level at which you teach) and how they use their curriculum. If Common Core is something with which you are still wrestling and something for which you need to continue to prepare your teachers or your district, find me on Twitter (elainej) or LinkedIn and let's talk. Maybe I can help.